The Colony is located sitting on the edge of a black hole with only one point of entry in what is a very large debris field. 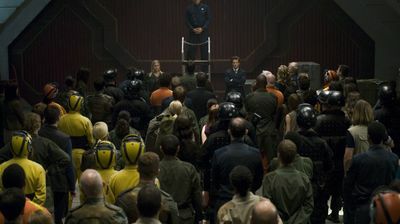 Knowing that the Galactica has reached the end of the line, Admiral Adama asks for volunteers to mount a raid on the Cylon base, realizing it may be the ship's last jump. In flashbacks prior to the Cylon invasion, key moments in the lives of several of the crew are presented.